Objective: To test whether ventilatory thresholds, measured during an exercise test, could be assessed using time varying analysis of respiratory sinus arrhythmia frequency (fRSA). Methods: Fourteen sedentary subjects and 12 endurance athletes performed a graded and maximal exercise test on a cycle ergometer: initial load 75 W (sedentary subjects) and 150 W (athletes), increments 37.5 W/2 min. fRSA was extracted from heart period series using an evolutive model. First (TV1) and second (TV2) ventilatory thresholds were determined from the time course curves of ventilation and ventilatory equivalents for O2 and CO2. Results:fRSA was accurately extracted from all recordings and positively correlated to respiratory frequency (r = 0.96 (0.03), p<0.01). In 21 of the 26 subjects, two successive non-linear increases were determined in fRSA, defining the first (TRSA1) and second (TRSA2) fRSA thresholds. When expressed as a function of power, TRSA1 and TRSA2 were not significantly different from and closely linked to TV1 (r = 0.99, p<0.001) and TV2 (r = 0.99, p<0.001), respectively. In the five remaining subjects, only one non-linear increase was observed close to TV2. Significant differences (p<0.04) were found between athlete and sedentary groups when TRSA1 and TRSA2 were expressed in terms of absolute and relative power and percentage of maximal aerobic power. In the sedentary group, TRSA1 and TRSA2 were 150.3 (18.7) W and 198.3 (28.8) W, respectively, whereas in the athlete group TRSA1 and TRSA2 were 247.3 (32.8) W and 316.0 (28.8) W, respectively. Conclusions: Dynamic analysis of fRSA provides a useful tool for identifying ventilatory thresholds during graded and maximal exercise test in sedentary subjects and athletes. As the two disproportionate increases in V˙I are explained by fR disproportionate increases, analysis of fRSA dynamic behaviour during a graded and maximal exercise test could reveal both the first and second ventilatory thresholds and provide practical applications as previously suggested. Such a method would be non-invasive and less expensive than the ventilatory flow and gas measurements required by ventilatory methods. The first objective of this study was to use the signal processing method we previously developed6 to extract fRSA from HP series recorded during graded and maximal exercise tests. Dynamic behaviours of fRSA and ventilatory indices were then compared as regards exercise intensity in sedentary and athlete groups. Fourteen sedentary healthy men (mean (SD) age: 24.5 (2.3) years) and 12 endurance athletes (age: 25.7 (2.8) years; >12 h of training/week) (characteristics shown in table 1) participated in the study. All subjects were non-smokers and none was taking medication. Physical activity and consumption of alcohol and caffeinated beverages were prohibited 24 h before the exercise testing session. Written informed consent was obtained prior to participation and ethical approval was granted by the Local Ethics Committee. Subjects performed a graded and maximal exercise test on a cycle ergometer (Ergomedic 824 E, Monark Exercise, Vansbro, Sweden) in a quiet room at a controlled temperature of 21°C, at least 3 h after the last meal. In the sedentary and the athlete groups, the initial load was fixed at 75 and 150 W, respectively, and increased by 37.5 W every 2 min until exhaustion. The pedalling rate was kept constant at 75 rev/min. Ventilatory indices and gas exchanges were measured using an automatic ergospirometer on a breath by breath basis (Metasys TR-M, Brainware, Toulon, France). Subjects breathed through a silicon facemask connected to a two-way non-rebreathing valve (Hans Rudolph, Kansas City, MO). Inspired and expired O2 and CO2 concentrations were measured using paramagnetic and infrared sensors, respectively. Averages every 10 s were then established for V˙I (l/min), O2 uptake (V˙o2, l/min), CO2 production (V˙co2, l/min), respiratory ratio (R), and ventilatory equivalents for O2 (V˙I/V˙o2) and CO2 (V˙I/V˙co2). fR was calculated on a breath by breath basis. Before each test, the gas analysers were calibrated with gases of known composition and an accurate controlled volume syringe was used to adjust the pneumotachograph. During the exercise tests, a one lead ECG (Cardiocap II, Datex Engstrom, Helsinki, Finland) was recorded and digitised on line by a 12 bit analog-to-digital converter (DAS 1600, Keithley Instruments, Taunton, MA) at a sampling rate of 1000 Hz, on a personal computer. Oxygen uptake was considered maximal (V˙o2max) if three of the following criteria were met: levelling off of V˙o2 despite increasing load, R greater than 1.10, and inability to maintain the fixed pedalling rate. The power corresponding to V˙o2max defined the maximal aerobic power (Wmax). R wave peak occurrence was estimated using a threshold technique applied to the filtered and demodulated ECG signal. HP series were visually inspected to ensure the absence of artefacts. In case of artefacts arising from a spurious R wave detection, the HP was restored by summing the two or more spuriously short periods. In cases of undetected R wave, the erroneous HP was replaced by using the two adjacent HP values. Artefacts did not exceed 1‰ of the total HP series. The first 20 s of exercise, which correspond to a marked HP decrease, were removed to limit sources of non-stationarity. In addition, the local mean HP was also removed using a polynomial approximation po(k) (order equal to 20) and a 100th order high pass finite impulse response filter was applied to the detrended HP series. Since the stationarity conditions are not fulfilled under dynamic exercise, classical spectral analysis methods were replaced by a previously described method.6,20 Using this method, the dynamic behaviour of fRSA was extracted. ECG preprocessing was performed using Matlab software 6.0 R12 (MathWorks, Natick, MA). 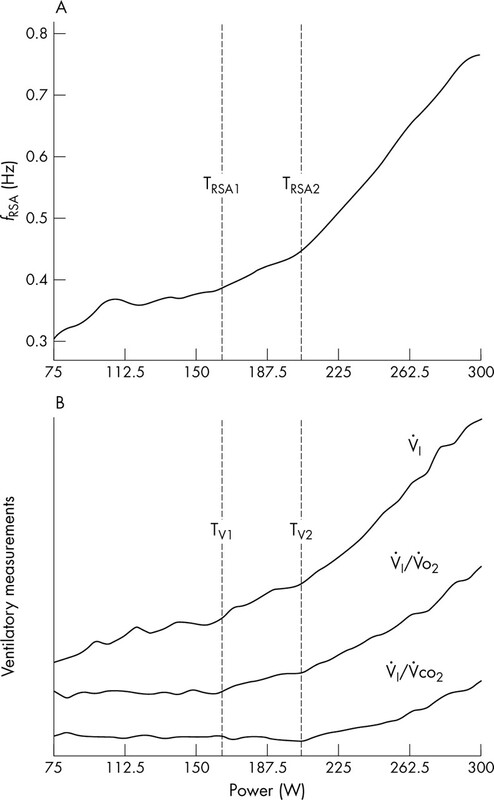 Ventilatory thresholds were determined from the time course curves of V˙I, V˙I/V˙o2, and V˙I/V˙co2 by a first independent operator. TV1 corresponded to the last point before a first non-linear increase in both V˙I and V˙I/V˙o2. TV2 corresponded to the last point before a second non-linear increase in both V˙I and V˙I/V˙o2, accompanied by a non-linear increase in V˙I/V˙co2.7 The fRSA thresholds were determined from the time course curve of fRSA by a second independent operator. The first fRSA threshold (TRSA1) corresponded to the last point before a first non-linear increase in fRSA. The second fRSA threshold (TRSA2) corresponded to a second non-linear increase in fRSA. 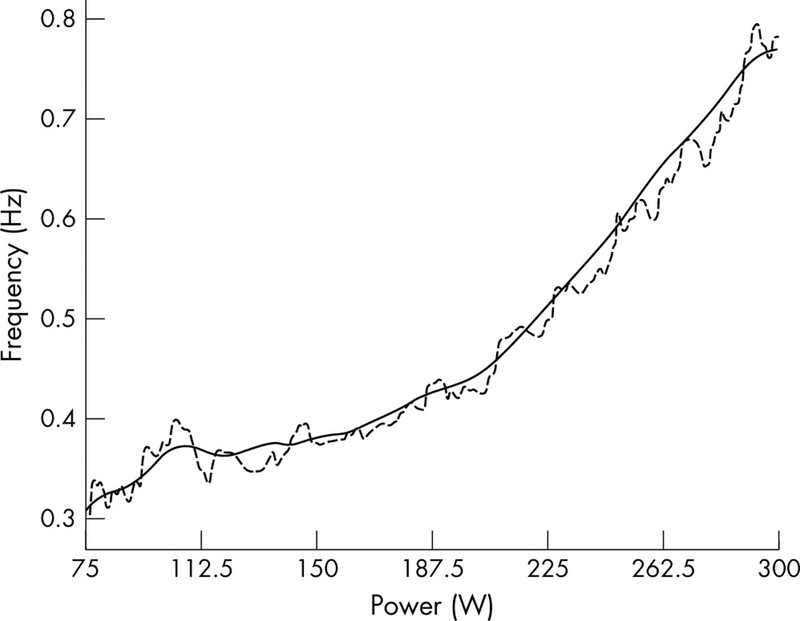 Thresholds were expressed in terms of absolute (W) and relative (W/kg) power and percentage of Wmax. Differences between the sedentary and athlete groups were tested using unpaired Student’s t test. Comparison and relationship between ventilatory and fRSA thresholds were tested using paired Student’s t test and a linear regression analysis, respectively. Individual relationships between fRSA and fR were tested by calculating Pearson’s r correlation coefficients. The mean (SD) of all individual correlation coefficients was then calculated. Statistical significance was set at p<0.05. Results are means (SD). Statistical analysis was performed using Statistica software 5.5 (StatSoft, Tulsa, OK). Athletes showed significantly higher values of V˙o2 and Wmax when compared to sedentary subjects (see table 1). A conspicuous high frequency oscillation synchronous with ƒR was found in all ECG recordings, clearly indicating the persistence of RSA over the entire graded and maximal exercise protocol. The dynamic evolution of ƒRSA was accurately extracted from the HP series and ƒRSA positively correlated (r = 0.96 (0.03), p<0.01) with ƒR (fig 1). Representation of the dynamic behaviour of RSA frequency (ƒRSA, solid line) and respiratory frequency (ƒR, dashed line) recorded in one subject during graded and maximal exercise test. Two non-linear increases were observed in ƒRSA in 21 of the 26 subjects. These non-linear increases coincided with TV1 and TV2, respectively (see fig 2) and no statistical difference was observed between TRSA1 and TV1 (absolute power: p = 0.98; relative power: p = 0.90; percentage of Wmax: p = 0.91) and TRSA2 and TV2 (absolute power: p = 0.57; relative power: p = 0.79; percentage of Wmax: p = 0.78). Power values and percentages of Wmax at TRSA1, TRSA2, TV1, and TV2 are presented in table 2. When expressed as absolute or relative power and percentage of Wmax, TRSA1, TRSA2, TV1, and TV2 were significantly higher in athletes than in their sedentary peers. Linear regression analysis showed high correlation between TRSA1 and TV1 (absolute power: r = 0.99, p<0.001 (fig 3); relative power: r = 0.99, p<0.001; percentage of Wmax: r = 0.95, p<0.001) and TRSA2 and TV2 (absolute power: r = 0.99, p<0.001 (fig 3); relative power: r = 0.99, p<0.001; percentage of Wmax: r = 0.96, p<0.001). Example of threshold determination using ƒRSA (A) and ventilatory (B) methods. ƒRSA, respiratory sinus arrhythmia frequency; TRSA1, first ƒRSA threshold; TRSA2, second ƒRSA threshold; TV1, first ventilatory threshold; TV2, second ventilatory threshold; V˙I, ventilation; V˙I/V˙o2, ventilatory equivalents for O2; V˙I/V˙co2, ventilatory equivalents for CO2. 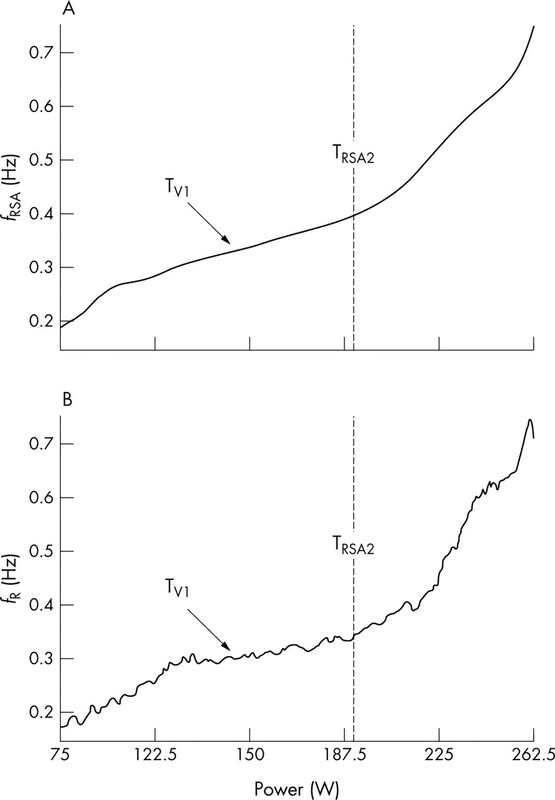 Relationships between absolute power measured at TRSA1 and TV1 (A) and TRSA2 and TV2 (B). Solid lines represent the regression lines. • Athlete group; ▴ sedentary group. TRSA1, first respiratory sinus arrhythmia frequency (ƒRSA) threshold; TRSA2, second ƒRSA threshold; TV1, first ventilatory threshold; TV2, second ventilatory threshold. In the five remaining subjects (three athletes and two sedentary subjects) only one non-linear increase was clearly identifiable and occurred close to TV2 (fig 4). Example of lack of clear change in ƒRSA (A) and ƒR (B) in the region of TV1. ƒR, respiratory frequency; ƒRSA, respiratory sinus arrhythmia frequency; TRSA2, second ƒRSA threshold; TV1, first ventilatory threshold. To assess HPV and RSA during non-stationary exercise conditions, we developed and validated an original method.6 In the present study, this method was used to process the cardiac electrical signal during a maximal and graded exercise test. Using our original approach, the dynamic pattern of fRSA was accurately extracted from R-R interval series; RSA and breathing have been shown to develop dynamically at the same frequency. This result confirms previous findings3–5 which showed that during exercise, heart rate is modulated by breathing at the fR. When ƒRSA was considered, we were able to point out two successive non-linear increases in 81% of our population. First, we observed that TRSA1 was closely related to TV1. This finding is consistent with those of Anosov et al4 who reported that significant changes in the behaviour of fRSA occurred in the region of the AT. As the fRSA pattern is closely linked to fR, we could state that the first disproportionate increase in V˙I observed at TV1 is mainly induced by an increase in fR. This is confirmed by the study of James et al8 who concluded that the first ventilatory threshold (referred as the AT in their study) could be detected by fR analysis. Thus, using fRSA to detect ventilatory thresholds has the advantages of being non-invasive and cheap and may have field application in ambulatory heart rate monitors. Moreover, this technique appears to be reliable in most athletes and sedentary subjects. fRSA thresholds of athletes were detected at higher values than those of their sedentary peers, whatever the mode of expression, confirming that the AT is significantly improved with endurance training.32,33 Thus, this fRSA method could be used for the determination of human ventilatory thresholds over a broad range of physical abilities. However, in 19% of our population only one increase close to TV2 was clearly identifiable in ƒRSA, whereas two ventilatory thresholds were detected. As V˙I is the product of ƒR and VT, it could be expected that the first non-linear increases in V˙I and V˙I/V˙o2 were mainly related to VT increase. Indeed, as shown in fig 4, no clear change in ƒR was observed around absolute power corresponding to TV1. Visual detection of both ventilatory and fRSA thresholds can lead to subjective results and may represent a methodological limitation of our study design. Indeed, it has been shown that different evaluators can choose different ventilatory thresholds from the same data.34 However, reliability of the ventilatory method is known to be enhanced when test conditions are kept constant and evaluators are experienced,21 which was the case in our study. Detection of ventilatory threshold is known to be dependant both on stage duration and load increase in graded exercise.35 As no exercise protocol test seems consensual, the standard protocol test used in our laboratory was thus preferred. We have shown that, in most of our subjects, two successive non-linear increases are observed in fRSA. These thresholds are closely related to the first and second ventilatory thresholds, respectively. Thus, the method we developed provides a useful tool for identifying the ventilatory thresholds during graded and maximal exercise test in athletes and sedentary subjects as well as for assessing endurance levels. The next step could be to process HP series recorded during an adapted field test using modern heart rate monitors and time varying modelling. Respiratory sinus arrhythmia results from modulation of sinus node activity by breathing and during exercise is the main mechanism regulating short term heart period fluctuations. Strong correlations have been found between the centred frequency of respiratory sinus arrhythmia and respiratory frequency. Two successive non-linear increases observed in respiratory sinus arrhythmia frequency are closely related to the first and second ventilatory thresholds, respectively. We have developed a useful method for identifying the ventilatory thresholds during graded and maximal exercise test in athletes and sedentary subjects as well as for assessing endurance levels. We thank the Brainware Company for their technical support. Perini R, Orizio C, Baselli G, et al. The influence of exercise intensity on the power spectrum of heart rate variability. Eur J Appl Physiol Occup Physiol 1990;61:143–8. Perini R, Milesi S, Fisher NM, et al. Heart rate variability during dynamic exercise in elderly males and females. Eur J Appl Physiol 2000;82:8–15. Bernardi L, Keller F, Sanders M, et al. Respiratory sinus arrhythmia in the denervated human heart. J Appl Physiol 1989;67:1447–55. Anosov O, Patzak A, Kononovich Y, et al. High-frequency oscillations of the heart rate during ramp load reflect the human anaerobic threshold. Eur J Appl Physiol 2000;83:388–94. Casadei B, Moon J, Johnston J, et al. Is respiratory sinus arrhythmia a good index of cardiac vagal tone in exercise? J Appl Physiol 1996;81:556–64. Meste O, Blain G, Bermon S. Analysis of the respiratory and cardiac systems coupling in pyramidal exercise using a time-varying model. In: Computers in cardiology. Memphis, TN: IEEE Computer Press, 2002:429–32. Reinhard U, Muller PH, Schmulling RM. Determination of anaerobic threshold by the ventilation equivalent in normal individuals. Respiration1979;38:36–42. James NW, Adams GM, Wilson AF. Determination of anaerobic threshold by ventilatory frequency. Int J Sports Med1989;10:192–6. Wasserman K. Breathing during exercise. N Engl J Med1978;298:780–5. Hughes EF, Turner SC, Brooks GA. Effects of glycogen depletion and pedaling speed on “anaerobic threshold”. J Appl Physiol1982;52:1598–607. Green HJ, Hughson RL, Orr GW, et al. Anaerobic threshold, blood lactate, and muscle metabolites in progressive exercise. J Appl Physiol 1983;54:1032–8. Aunola S, Rusko H. Aerobic and anaerobic thresholds determined from venous lactate or from ventilation and gas exchange in relation to muscle fiber composition. Int J Sports Med1986;7:161–6. Davis JA, Vodak P, Wilmore JH, et al. Anaerobic threshold and maximal aerobic power for three modes of exercise. J Appl Physiol 1976;41:544–50. Yoshida T, Nagata A, Muro M, et al. The validity of anaerobic threshold determination by a Douglas bag method compared with arterial blood lactate concentration. Eur J Appl Physiol Occup Physiol 1981;46:423–30. Caiozzo VJ, Davis JA, Ellis JF, et al. A comparison of gas exchange indices used to detect the anaerobic threshold. J Appl Physiol 1982;53:1184–9. Burke J, Thayer R, Belcamino M. Comparison of effects of two interval-training programmes on lactate and ventilatory thresholds. Br J Sports Med1994;28:18–21. Kindermann W, Simon G, Keul J. The significance of the aerobic-anaerobic transition for the determination of work load intensities during endurance training. Eur J Appl Physiol Occup Physiol1979;42:25–34. Farrell PA, Wilmore JH, Coyle EF, et al. Plasma lactate accumulation and distance running performance. Med Sci Sports 1979;11:338–44. Bosquet L, Leger L, Legros P. Methods to determine aerobic endurance. Sports Med2002;32:675–700. Meste O, Blain G, Bermon S. Some considerations on the IPFM model for the heart rate variability analysis. In: Computers in Cardiology, 2003. Thessaloniki, Greece: IEEE Computer Society Press, 2003:709–12. Svedahl K, MacIntosh BR. Anaerobic threshold: the concept and methods of measurement. Can J Appl Physiol2003;28:299–323. Akselrod S, Gordon D, Ubel FA, et al. Power spectrum analysis of heart rate fluctuation: a quantitative probe of beat-to-beat cardiovascular control. Science 1981;213:220–2. Malliani A, Pagani M, Lombardi F, et al. Cardiovascular neural regulation explored in the frequency domain. Circulation 1991;84:482–92. Pomeranz B, Macaulay RJ, Caudill MA, et al. Assessment of autonomic function in humans by heart rate spectral analysis. Am J Physiol 1985;248:H151–3. Warren JH, Jaffe RS, Wraa CE, et al. Effect of autonomic blockade on power spectrum of heart rate variability during exercise. Am J Physiol 1997;273:R495–502. Ekblom B, Goldbarg AN, Kilbom A, et al. Effects of atropine and propranolol on the oxygen transport system during exercise in man. Scand J Clin Lab Invest 1972;30:35–42. Robinson BF, Epstein SE, Beiser GD, et al. Control of heart rate by the autonomic nervous system. Studies in man on the interrelation between baroreceptor mechanisms and exercise. Circ Res 1966;19:400–11. Blain G, Meste O, Bermon S. Influences of breathing patterns on respiratory sinus arrhythmia in humans during exercise. Am J Physiol Heart Circ Physiol2005;288 (2) :H887–95. Cournand A, Motley HL, Werko L, et al. Physiological studies of the effects of intermittent positive pressure breathing on cardiac output in man. Am J Physiol 1948;152:162–74. Arai A, Kodama I, Toyama J. Roles of Cl− channels and Ca2+ mobilization in stretch-induced increase of SA node pacemaker activity. Am J Physiol 1996;270:H1726–35. Hagiwara N, Masuda H, Shoda M, et al. Stretch-activated anion currents of rabbit cardiac myocytes. J Physiol 1992;456:285–302. Rowbottom DG, Keast D, Garcia-Webb P, et al. Training adaptation and biological changes among well-trained male triathletes. Med Sci Sports Exerc 1997;29:1233–9. Foster C, Fitzgerald DJ, Spatz P. Stability of the blood lactate-heart rate relationship in competitive athletes. Med Sci Sports Exerc1999;31:578–82. Yeh MP, Gardner RM, Adams TD, et al. “Anaerobic threshold”: problems of determination and validation. J Appl Physiol 1983;55:1178–86. Kang J, Chaloupka EC, Mastrangelo MA, et al. Physiological comparisons among three maximal treadmill exercise protocols in trained and untrained individuals. Eur J Appl Physiol 2001;84:291–5. During the past 20 years, very many studies have indicated that parameters measured during submaximal exercise may be better markers of endurance performance than Vo2max, the anaerobic (or ventilatory) and lactate thresholds being useful parameters to evaluate functional capability in various types of endurance performance. Both gas analysis and ventilatory flow measurements, as well as blood lactate determinations, can be used to estimate the anaerobic threshold as a predictor of endurance capacity. A procedure that would be simple, relatively inexpensive, and non-invasive would be welcome. Procedures based on maximal heart rate (or a percentage of it) are simple but not reliable. Thus, the determination of ventilatory thresholds by time varying analysis of respiratory sinus arrhythmia, as proposed in this paper, appears to be quite promising, providing that it can be used with data obtained by ambulatory heart rate monitors.